Calling all 2011 Connecticut seniors! 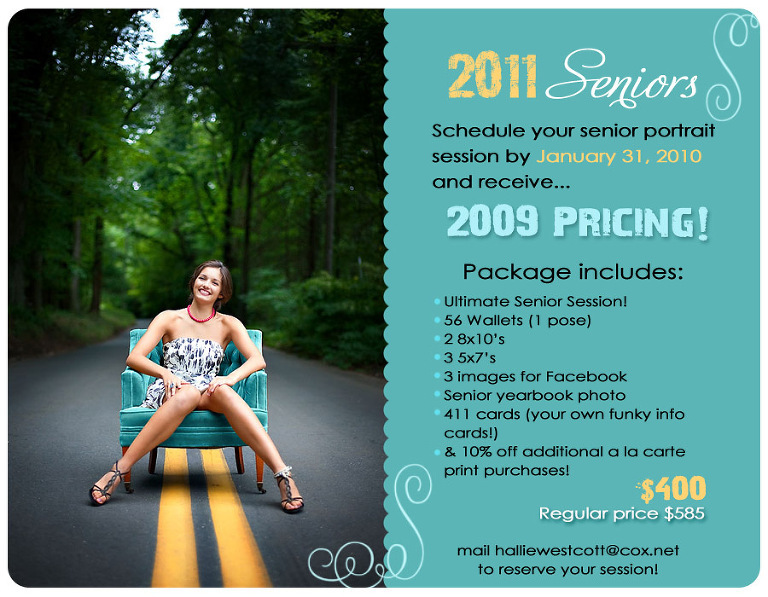 If you book your “2009 for 2011” senior session by January 31, 2010, you will receive 2009 prices! A $185.00 savings! To find out more about senior sessions, just fill out the contact form located here and I will get right back to you. All senior sessions have unlimited locations within a ten mile radius, unlimited clothing changes and unlimited time! So set up your session soon and don’t miss this awesome package! If you are coming from a contract school and must have your yearbook photo taken with the school’s contracted photographer….no problem. You can have your senior photo taken with them and have the FUN PHOTOS done with me, and receive a $30 discount off your session fee. PS – I’ll be looking for 2011 CT Senior Reps soon, so stay tuned for the details!